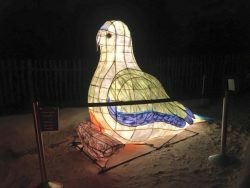 Matilda, the Orange Bellied Parrot was commissioned for the 2017 Winter Nights Program. She was named after the first bird in the breeding program that was released and that returned to Werribee as a wild migratory bird. 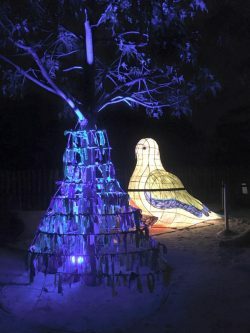 This year we also created a wishing tree for the community to make a wish for the Orange Bellied Parrot. Bandy the Bandicoot was commissioned by the Werribee Open Range Zoo in 2016 for the Winter Nights program. If you are interested in commissioning a lantern or developing a lantern parade with your community please contact me stef@stefanierobinson.com. Click HERE For more information about lanterns. or HERE for an example of lanterns used for community recovery.